Six interesting articles, images or what-nots I’ve come across on the web this week. Love these Be A Healthier You printable pages from The Project Girl. They’re US letter paper sized, but I printed one out on A5 so it would fit my organiser and it’s perfect! Would love to make a quilted cover for my moleskine a journal. Checking out these for inspiration: Bloom Journal Cover Tutorial, Sew Me Something Good Patchwork Quilted Journal Cover and right down the bottom of this post from Diary of a Quilter is a cute journal cover, inspired by the All People Quilt tutorial (link to PDF file under the image). On Pinterest? Check out this great collection of Mail Art pins. Also discovered via Pinterest, these absolutely gorgeous lavender-filled vintage postcard sachets. Some printable writing paper – cute Bunny Love paper by tho-be on Deviant Art. Looking for Christmas themed writing paper? Here’s some winter paper to print from PinkWool.com and some beautiful Letters to Santa from A Little Delightful blog. 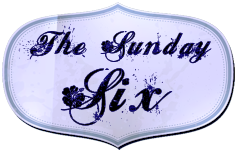 This entry was posted in General and tagged Custom Inserts, Journal Cover, Journaling, Printables, Sunday Six by Sammie. Bookmark the permalink.